Queen’s Greatest Hits, Track 17. Or, seeing as it’s Record Store Day and you might have it on vinyl, Side 2 Track 9. Job done. No ifs, not buts. No hoping to avoid a mathematical freak. The Irish League Champions arrived at Windsor Park today and set up camp in the away dressing room. By 5pm, they were now based in the home dressing room. A win at Ballymena United the previous week meant that Linfield were virtually Champions but still needed one point to make sure, as they began the first of three successive home games with a game against a side they have beaten three times out of three in the League. It was a far happier situation for Linfield than when they travelled to Seaview to face Crusaders in this weekend last year. Having kept a winning team in recent weeks, Linfield had to make a change today with Josh Robinson unavailable. Ryan McGivern got the nod to replace him, surprisingly ahead of Mark Stafford. Crusaders had the first attack of the game, spending the first few minutes in Linfield’s half, but Linfield were able to clear the danger, the best that Crusaders could offer was a Ronan Hale shot that went over the bar. Linfield’s first attacks saw a Jamie Mulgrew run try to set up Jordan Stewart but he couldn’t get into a striking position, while a cleared corner fell to Daniel Kearns who fired over. There was even a bizarre incident where Howard Beverland got a yellow card for fouling Jamie Mulgrew. Nothing new there, but Beverland was off the pitch after receiving treatment. Opposition teams are now finding creative ways to foul him. Gareth Deane was forced into a save from a Philip Lowry header before Jamie Mulgrew had a penalty appeal turned down. Linfield had a strong finish to the half, being camped in Crusaders half, but couldn’t get the breakthrough. 0-0 at half-time, job done. Not the three points wanted to do it in style, but job done. Paul Heatley had the first shot on goal in the second-half, his shot on the counter attack being saved by Gareth Deane from a wide angle. Soon after, Linfield were presented with the best opportunity of the game when they were awarded a penalty for a handball by Michael Reddy. Andrew Waterworth, Andrew Mitchell and Jordan Stewart loitered around the ball, with Stewart getting the nod to take it. Stewart had scored every penalty he’d taken this season which was ominous, which meant he was due to miss one, like when Stephen Lowry missed one against Dungannon Swifts in 2017. Those fears proved to be right as his spot kick was saved by Gerard Doherty. It was a good save by him, but it was a good height for the keeper. We probably should have tried to dive and get a penalty when we were 5-0 up at Dungannon recently just so he could miss it and get it out of the way. Doherty was making another save soon afterwards when Ryan McGivern flicked goalwards from a corner. David Healy turned to his bench, bringing on Stephen Fallon, Kirk Millar and Marek Cervenka in search of a winner. The closest either of them cam was when Fallon got in behind Crusaders defence and crossing when he perhaps should have shot, taking Daniel Kearns by surprised who would have scored if he ran in, but he stopped having anticipated a shot. It was a 0-0 sort of game, you know what I mean, both teams were trying, but not really looking like scoring. With a few minutes remaining, the final whistle blew at Solitude, where Cliftonville held Ballymena United to a 1-1 draw. It meant that Linfield were Champions regardless of the score at Windsor Park, not that they planned on conceding a late winner to Crusaders for the third successive meeting. They didn’t, it finished 0-0. It wasn’t as dramatic as in 2017, but Linfield were Champions again. It was a day of draws in the Top Six, much to the frustration of Glenavon who conceded a late equaliser to dent their chances of claiming 2nd and securing automatic European football. The farce that is the UEFA Cup Play-Offs is of no concern to Linfield. It’s looking likely that the presentation will be next Saturday against Glenavon, even though the protocol is for it to be in the last home game. It makes sense to have it on a Saturday afternoon rather than a Tuesday night when it will be more convenient for more people to attend. This win wipes away the ghost of the 2017-2018 season. What went wrong? Everything. It was hard to see it coming. Linfield recruited well, securing three signings in May 2017 while other clubs were playing in the UEFA Cup Play-Offs. Of those three signings – Robert Garrett, Jordan Stewart and Andrew Mitchell – Two had won the title while the other had won the Irish Cup. Josh Robinson was added in mid July, another title winner. The signings were no brainers, and three of them proved to be key players this season. They came in to replace Sean Ward, Josh Carson and Ross Gaynor, who left in pursuit of first team football (although Gaynor is now playing at a lower level due to employment commitments) and you couldn’t blame them for doing so. The irony is, they probably would have played 30-40 games in 2017-2018 if they had stayed. The team picked itself in the final months of 2016-2017, and there was nothing they could do about it. Andrew Waterworth and Jimmy Callacher both missed pre-season due to injury, and were always playing catch-up in terms of fitness when they returned. There were even injuries at the other end of the season, with both Jordan Stewart and Jamie Mulgrew missing the run-in. Linfield were lost without Mulgrew in the final weeks. It was a perfect storm. We weren’t creating enough chances. When we did we were missing them. We were conceding bad goals due to individual errors. We were losing or drawing games we should have won. Part of that was remedied in the signings of Joel Cooper and Daniel Kearns, both of whom hit the ground running as part of a 4231 formation forced on David Healy due to a shortage of midfielders on the opening day. It was obvious from his 45 minute debut in a friendly at Dundela in July that Cooper was going to be a star player for Linfield, even if a title win looked far away during the first-half of that game as we were lucky to be 1-0 down. I’m going to put 2017-2018 down to us angering the Football Gods with those idiots against Celtic for landing us with a partial ground closure for one European match, expecting to serve it in the Summer of 2018, we’d have to wait a year for that. Just a heads up about that if you like to sit at the end of the South Stand closest to The Kop. You could perhaps argue that Linfield had too easy a start in 2017-2018 and weren’t ready by the time the big games came around. This would not be the case in 2018-2019, with trips to Glenavon, Crusaders and Cliftonville before the end of August. Things didn’t start great, penned into their own half and conceding a penalty inside the first five minutes of the opening game of the season at Mourneview. Thankfully, it was missed, and when Linfield had a period on top, they scored to win 1-0, but were thankful to their defence for helping to keep a clean sheet. Clean sheets would be a theme throughout the season. The second match of the season against Institute was scheduled for a Friday night allowed them to get points on board early and put pressure on rivals, which they did winning 3-0. Having seen Crusaders be walloped in Europe, and then concede twice in both of their opening two League games, Linfield knew they had nothing to fear from Crusaders, and so it proved, securing a 2-0 win, which could have been more. The following week saw the first points dropped and first goal conceded in a 1-1 draw at Cliftonville, with a late equaliser from substitute Michael O’Connor. Linfield’s success this season was built on a contradictory mix of having a settled starting eleven, but also utilising the squad. Mark Haughey missed the season through injury, Chris Casement took his face. Mark Stafford was suspended on the opening day, Josh Robinson came in and never looked back. When Robinson was injured in October/November, Stafford took his place and even produced a late winner at Dungannon. Stafford even filled in when Callacher got injured at Seaview in January. Stephen Fallon broke into the team when Andrew Mitchell got injured, and then Kyle McClean took advantage when both of them were injured. Most famously, Jordan Stewart made the most of his opportunity when Daniel Kearns got injured. Gareth Deane came in for the injured Roy Carroll at Newry in January, and then filled in when Carroll’s injury was confirmed as season ending. In that game at Newry, Deane saved a penalty. That same match saw Michael O’Connor come in for the suspended Andrew Waterworth and score twice in a 2-0 win. Suspensions and red cards were a lot rarer this season as well. When somebody came into the team, more often than not, when someone came into the team, they made the most of the opportunity. That game at Solitude saw Linfield play with ten men after a first-half red card for Jamie Mulgrew. The previous meeting against Cliftonville, four months earlier, saw Linfield capitulate after a first-half red card. Not this time. September began on a frustrating manner with a 0-0 draw against Ards. Naturally, this is frustrating, but even more so with Crusaders and Coleraine playing each other on Sky on the Monday night after it, and then not having a League game the following weekend due to playing in the Scottish Challenge Cup. It was an opportunity to pull clear of rivals that was missed. No mistake was made the following weekend, blasting aside Warrenpoint 5-0 though. A 0-0 draw at Coleraine in mid September wasn’t the worst result in the world, as it kept Linfield five points clear of Coleraine albeit with a game more played, it was frustrating as there was a traffic jam forming in the table when Linfield were looking to pull clear. Those draws allowed Glenavon to take leadership of the League table. At the end of the month, Linfield beat Ballymena United 2-1 to go eight points clear of them. I thought that would be the last time we’d have to worry about them. October began with a throwback, a top of the table clash against Glentoran, live on Sky, which Linfield won 1-0 and sent their season into freefall. That was followed by a win over Newry City with a hat-trick from Jimmy Callcher. Everybody played, eight wins, three draws and no defeats. There were also eight clean sheets in those eleven games. However, there would soon be a run of no League clean sheets in two months as Linfield entered a sticky period. October has been a problematic month for Linfield in recent years, so five wins from six matches in all competitions was a miracle. That one blemish was a shock defeat to relegation threatened Ards. Espeecially frustrating as it was dropped points at the start of a run of games against Bottom Six teams. November didn’t get off to a good start with a draw against Warrenpoint Town and a defeat to Coleraine, both at home. The turning point of the season turned out to be a trip to The Brandywell in November to face Institute. It didn’t feel like it when we were 1-0 down. We turned it around and won 4-1. Joel Cooper was dropped for the first time as a Linfield player having lost his way after being kicked out of the game at The Oval in October. A brief came at The Brandywell saw him regain his form, and an injury gave him an opportunity against Cliftonville the following week. They couldn’t handle him. It was the start of a run of games at home in the space of four months where four was the magic number, where Cliftonville, Crusaders, Glentoran, Warrenpoint Town and Glentoran again left after picking the ball out of the back of the net four times. December was full of big games. The first of the month saw Linfield lose to Ballymena who overtook them at the top. Especially frustrating as we were 1-0 up and could have killed off their title hopes. Instead, it gave them the boost of life. By this point, we were managing a schedule of Midweek-Saturday. Even though our County Antrim Shield game against Ballymena was postponed twice, we were still having to prepare for it, as well as Bank Holiday games taking place on weekday afternoons. A draw at home to Glenavon on the Saturday before Christmas saw Ballymena go four points clear. They had a generous run of games coming up as well. The only Top Six teams they were facing soon, Coleraine and Crusaders, were both out of form. However, Coleraine and Crusaders did us a favour, and by New Year’s Day, Linfield were top. By mid January, it was now three points clear. With the superior Goal Difference (from all those scrappy 1-0 wins that those in North Antrim would have you believe), Ballymena needed Linfield to slip up twice. Crusaders were never in the title race, and a win at Seaview made sure we weren’t going to let them into it. That was followed up by a win at Newry in midweek while Ballymena didn’t play to make the lead six points. Points on the board always trumps games in hand. February began with an Irish Cup exit and going 2-0 down to Coleraine. Questions were being asked of Linfield. They answered them by coming back to win 3-2. Ballymena were defeated at Windsor Park to make the gap nine points, having been defeated in the NIFL Cup Final a week earlier. There was no time for rest as Linfield struggled at Newry the following midweek. A draw would have undone the win over Ballymena and given them a lifeline, but Linfield dug out an injury time winner. You could hear the groans in Ballymena. You would soon be hearing cheers in Ballymena as Linfield lost at Glenavon, while Ballymena responded with a win at Coleraine. If Ballymena won their game in hand, the gap would be three points, and with Linfield still to come to Ballymena, they were eyeing up being level with four to play. Thankfully, shock home defeats to Glentoran and Warrenpoint Town for Ballymena saw Linfield arrive nine points clear. A 1-0 win saw them leave twelve points clear. It was almost job done. This 0-0 draw sealed the deal. There’s still something to play for as winning our final games will secure a 90 point haul, something Linfield have never done in a 38 game season. The previous best in a 38 game season was 89 in 2017. And, can we go through a season without losing at home to Cliftonville please? It would be the first time sine 2011-2012 if we do. 20 clean sheets out of 35 matches. Originally put back two weeks due to a Semi-Final postponement, then it got postponed itself, before changing venue, finally, the 2019 County Antrim Shield took place, as Linfield headed to Seaview looking to win their second trophy of the season. The fact that it was Linfield and Crusaders going head to head in the Final shouldn’t have been that big a shock. This was the sixth Final in seven years that two out of Ballymena United, Crusaders and Linfield have met in the Final. If it’s one of those two teams going head to head in the 2020 Final, they might as well just make it a three team tournament. This was the third meeting of Linfield and Crusaders during that run, with Linfield winning in 2014 and 2017. Heading to the ground, it was so windy, there was a serious danger that if Crusaders played a long ball upfield, it might not come down for 27 minutes. There were changes in the Linfield XI, not that surprising given previous Shield team selections this season. With Gareth Deane playing in the 2017 Final as a rare opportunity for a second choice keeper to get a game, by 2019, he was now first choice, making way to give Conor Mitchell a debut. Mark Stafford and Andrew Mitchell came in as players who haven’t played recently were given an opportunity, with Jamie Mulgrew missing through suspension. Linfield had the better of the early stages and had a lot of pressure on Crusaders goal. They got their reward when Sean O’Neill dropped a corner, which fell perfectly for Mark Stafford to head home after 9 minutes, two minutes earlier than when he scored for Linfield in the 2017 Final. Billy Joe Burns was lucky to get away with a yellow card for a late tackle, benefitting from the lack of minutes that were on the clock. Crusaders soon got into the game and had some chances of their own, with Jordan Owens having a header that he should have scored, which David Cushley had a speculative shot saved. Not sure if you should count that, as he usually has about twenty speculative shots a game. One of those shots soon found the back of the net from outside the penalty area, though questions have to be asked as to why Linfield failed to clear despite having two opportunities to do so in the build-up. If Linfield fans were worried about how their team would respond to this setback, they had no need to be, as they responded to conceding one goal by scoring two themselves. Andrew Waterworth nipped in front of a Crusaders defender to get to the ball first, running clean through on goal, only to see his shot saved, but Kirk Millar followed up to finish into the open net from a few yards out. Surprisingly, it was only Millar’s fourth goal against teams in the current Top Six, having scored against Glenavon in 2015 and twice against Coleraine in 2016. It was very timely, though it should be pointed out that he compensates for his lack of goals with assists. A minute later, it was 3-1 to Linfield when Millar resorted to assisting duties when his cross was header by a Crusaders defender off Colin Coates and in, though the PA Announcer gave it to Jordan Stewart because he was loitering in the penalty area, it was clearly an own goal. Coates was then going in the referee’s notebook after grabbing Andrew Waterworth’s neck after a challenge. Of course, it was only going to be a yellow at worst. Chris Casement had a free-kick tipped over while Declan Caddell had a shot saved as both teams searched for a goal before half-time, which saw Linfield have a 3-1 lead. The second-half would have the wind in Crusaders favour, but Linfield weren’t 3-1 up because of the weather. They were 3-1 up because they’re a better team. Linfield had the first chance of the second-half when Andrew Waterworth broke down the left to set up Jordan Stewart, who was denied. Crusaders then started to see more of the ball and Linfield struggled to get the ball clear, literally, as the wind kept blowing it back towards their goal. Not that it bothered Josh Robinson, who nonchalantly headed the ball back to Conor Mitchell from long range, without fear that it would end up in his own net. Conor Mitchell was especially struggling with his kickouts, trying various techniques to find one that would see the ball not return to Linfield’s defensive work, with minimal success. The pressure on Linfield’s goal was usually seen off, but only just, getting a body in the way more often than not. Linfield needed to get the ball away from their own goal, as there would be no way of riding out such pressure for an entire half. That proved to be the case when Colin Coates headed home to make it 3-2. The goal didn’t inspire an immediate fightback, as Linfield not only held out, but had their own sustained period of pressure, with a Mark Stafford overhead kick being denied by a save from Sean O’Neill. As the final minutes approached, Crusaders began the run out of ideas. Their main idea of kicking it up in the air and hoping to get a lucky bounce wasn’t working. However, they had one final corner. You began to get bad vibes as soon as Crusaders set up for a corner, as the body language of the Linfield players didn’t look right, they didn’t look like they were ready to defend it. And so it proved, as Jordan Forsythe finished from close range to make it 3-3. Just when it looked like it was heading for extra-time, David Cushley headed home to make it 4-3 and put Crusaders in front. Linfield responded with an attacking urgency that should have been there 45 minutes earlier. To be brutally honest, this was a trophy that was thrown away. We weren’t 3-1 up at half-time because of the weather, we were 3-1 up because we’re a better team. We allowed ourselves to be spooked by the weather and believed that it made Crusaders a better team than they really are. We also didn’t help ourselves by not making a substitution at any point during the game. Even though there are only substitutes allowed in the County Antrim Shield, there were still options for Linfield. Daniel Kearns, Marek Cervenka and Kyle McClean all could easily have made a positive impact if any of them were introduced from the bench. The attitude in the second-half shouldn’t have been can we hold on to the lead, but can we extend it? We surrendered the initiative to Crusaders and lost a game we never looked like losing. Twice in a row now, we’ve lost to Crusaders because we weren’t concentrating in the final minutes of a game. So, the trophy chase is now – one in the bag, two gone and the big one to play for. The day after this game, Linfield’s post-split fixtures were confirmed, even though teams can change position before the end of Matchday 33. But before then, Institute and Dungannon. You sometimes get strange quirks in the Irish Cup. For the second successive season, Linfield hosted opposition from North Belfast who were hoping to avenge a Quarter-Final defeat at home two years previously. For the first time in a long time, Linfield made several unenforced changes to their starting eleven, Stephen Fallon coming in after injury, and Daniel Kearns and Michael O’Connor were rewarded for changing the game against Glentoran five days earlier with a start. David Cushley had the first chance of the game, firing wide from an angle. It was never really troubling the goal, but it looked a lot closer than it was from where I was sat, at the other end of the pitch. Linfield were then forced into an early change after 6 minutes when Stephen Fallon went off injured and was replaced by Kyle McClean. Having to make an early change is never ideal in any game, but especially in one that could last 120 minutes. Linfield’s first attack came to an abrupt end when a Joel Cooper run was ended by a foul by Rory Hale. The biggest surprise was that a yellow card was awarded, mainly due to the unwritten rule in Irish League football that referees don’t issue yellow cards in the first 15 minutes of a game. The resulting free-kick from Chris Casement went just wide. Cooper was then able to get away from Crusaders defence without being fouled but fired wide from a wide angle when a cross to Kyle McClean looked like a better option. This was after he had an early shot from the edge of the box blocked behind for a corner. Linfield continued to dominate the half but couldn’t get a breakthrough. That was, when the ball was in play, due to Crusaders timewasting at goal kicks at a level that would embarrass Elliott Morris. Eventualy, 119 minutes, Sean O’Neill was booked for booting the ball into the North Stand when given it by a ballboy. It should have been his tenth of the game. The Ballboys were, no pun intended, on the ball, making sure a new ball came back into play as soon as another ball went out, but those on the pitch need to start making an issue of it, putting refs under pressure by flagging it up and getting it actioned. We can’t allow ourselves to be outsmarted by stupid teams, we can’t let opposition dictate the pace of the game and be comfortable doing so. The game should be played at our pace. There’s not much you can do though when you have a weak referee who is easy to make a mug of, and Crusaders weren’t slow in exploiting it. At the start of the second-half, Crusaders introduced Jordan Owens from the bench, and in the opening minutes, Ronan Hale volleyed over. Linfield responded with a Kyle McClean header which hit the post, before Michael O’Connor had a shot saved and then had a header against the bar. Nobody dared say it, but we were starting to think it, that this was going to be a repeat of the Cliftonville game in the Irish Cup last season. Linfield now turned to the bench to try and win the game, with Kirk Millar coming on for Joel Cooper. With each passing minute, it looked like Andrew Waterworth was being saved for the possibility of Extra-Time. He ended up coming on quite late in the regulation time, coming on for Daniel Kearns as Linfield went more attacking to try and win the game in 90 minutes. It was Crusaders who had the best chance in injury time when Kyle McClean was forced to save a goalbound shot on the line. It finished 0-0 at 90 minutes and went to Extra-Time. Extra-Time in the Irish Cup isn’t a new experience for Linfield in the Irish Cup under David Healy, after needing two hours to defeat Ballymena in 2016 and Glentoran in 2017. Hopefully, this was going to be three out of three. This looked like the sort of game that was going to be goal the winner. Making that breakthrough would be so crucial. It looked like Linfield were going to get it when Andrew Waterworth headed over from six yards out. He really should have scored, or at least get the shot on target and make the keeper work. Soon after Crusaders went 1-0 up in typical Crusaders fashion, a long hoof upfield fell for Jordan Owens to smash home. To be fair, it was a decent strike, but it should have been defended better, to win the original header, and to make sure the second ball was won. That looked like being it. Linfield responded by bringing on Marek Cervenka for Jordan Stewart. Not through choice though as Stewart was suffering from an injury, watching the remainder of the game from the bench with an ice pack strapped to him. As the clock ran down, Cervenka gave Linfield a lifeline when a misplaced Crusaders pass played him through to make no mistake to make it 1-1. The ball was in the back of the net as soon as he set himself up to strike. Now the momentum was with Linfield to go an win the game. But Crusaders went straight on the attack with Gareth Deane saving from David Cushley. From the resulting corner, Billy Joe Burns scored to win the game for Crusaders. It wasn’t the first time a second ball had fallen to Crusaders when they had an attacking set piece. They were two bad goals to concede. It was an absolute travesty of a result. One team trying to win the game, and another trying to play for penalties. There still should have been enough time for Linfield to get a second equaliser, due to the amount of stoppages, but the Referee’s watch wasn’t working. The worst thing about this result, as it was when we lost to Cliftonville last season, is that we all know Crusaders will choke in the Quarter-Finals or Semi-Finals. The Clean Sweep is over, but nobody was ever really talking about it. The season, however, is far from over. This was Linfield’s first defeat since early December. We simply have to do what we did then, dust ourselves down and go again. When we lost to Ballymena in December, we had a game straight away on the Tuesday night. We have that again. One thing about this result that we can use to our advantage, is that we can use the free weekend at the start of March to slot in our rearranged League match against Newry City, which is currently scheduled for the midweek before. It makes so much sense for both sets of players and fans for the game to take place on a weekend, hopefully that option gets explored. We all hoped that February would be the month that Linfield win two competitions and make progress in two others. It can still be a month where Linfield win two competitions and progress in another. Three was the magic number prior to kick-off at Seaview. Obviously, three points on offer, with Linfield having a three point lead over Crusaders, looking for their third win of the season over Crusaders, in the first of three games between the sides in eighteen days. The League table had a familiar theme to the previous meetings, with Linfield looking to extend their lead over Crusaders. In August, Linfield held a two point lead, became a five point lead at full-time. That five point lead was still in place by the second meeting in December, but was eight by full-time. By January, it was now three points, but Linfield had a game in hand, due to Crusaders going on a six game winning run since then. You could argue that run is a bit deceptive. Four of those wins have come against teams in the bottom six, and of those four wins, three of them have been by one goal. They’ve been scraping by. A draw wouldn’t have been the worst result, but a win represented an opportunity to pull clear of a title rival and have some daylight. Crusaders wouldn’t be out of the title race with a defeat, but you’d have to put across a very convincing argument as to why they were in it. Crusaders first attack saw a series of attempted shots blocked by various Linfield bodies. Not surprising given the clean sheet run in the League that Linfield are currently on. Crusaders were the last team in the League to score against Linfield. That would still be the case regardless of what happened at Seaview, but Linfield weren’t in the mood for that stat to be updated. Linfield’s first attack was a lot more effective. A long ball seemed to cause confusion in Crusaders defence, allowing Jordan Stewart an opportunity to nip in and lob the ball over the onrushing Gerard Doherty to put Linfield 1-0 up. Doherty was one of three former Derry City players making their home debut for a Crusaders side which had Hale but no Pace. There’s almost as many ex Derry players than ex Linfield players. You could do a Venn Diagram of the ex Derry players and ex Linfield players in their squad, and put Philip Lowry and Rory Patterson in the middle. The first goal was important in this fixture. That isn’t clichéd pundit speak, there is statistics to back it up. The last time a team scoring first at Seaview failed to win was September 2014. The last time a team scored first and lost was April 2014. Linfield last scored first and lost there in January 2013. This is a fixture where the first goal has been key in recent years. Hopefully in the upcoming meetings in February, we’ll have goalscoring contributions from Jiall Quinn, Jeven Fallon, Jirk Millar and Jandrew Waterworth. Cooper and Stewart were getting a lot of joy when combining up front as Linfield took control of the game. It felt like they had fifteen players on the pitch. Any time that Crusaders had an opportunity to get the ball forward, it was usually intercepted by Jamie Mulgrew. Andrew Waterworth had a header saved by Doherty as Linfield looked to convert their dominance into a two goal lead. Every time a Linfield player had the ball, they always seemed to have options to pass to and space to operate in. On some occasions, they had both. Paul Heatley curled wide with Crusaders best chance of the first-half. It was their only chance of note in the half. All their other attempts on goal were speculative efforts which never troubled Roy Carroll. In the previous two meetings, Linfield got early second-half goals to secure the points, in August going from 1-0 to 2-0, and in December from 2-0 to 4-0. If they repeated it here, it would surely secure the points. They didn’t get it, but there was no real response from Crusaders. All they offered was an overhit cross from Ross Clarke which was tipped over by Roy Carroll when it looked like it might sneak in. The only moment of worry came when Mark Stafford intercepted a cross and got the ball stuck between his legs with Crusaders players swarming around him, but he was able to clear at the expense of a corner. Stafford had come on as a sub for Jimmy Callacher, who went off injured, showing the value of the squad, having players who can fill in when needed. It would be expected that Daniel Kearns and/or Michael O’Connor would be introduced in the final stages, so it wasn’t ideal having to use a sub so early as there wouldn’t be much room for manoeuvre regarding bringing players on from the bench. By this point, a quick free-kick set up an opportunity for Joel Cooper, but he fired wide from a tight angle. Kirk Millar then tried his luck from a tight angle (Think Marco Van Basten v Soviet Union) but was narrowly wide. Crusaders resorted to trying to wind up Linfield’s players, but only succeeded in winding themselves up, losing their discipline and racking up yellow cards. Howard Beverland managing to pick up the stupidest yellow card for obstruction, looking to see where the player was and blocking him off, right in the eyesight of the referee. He got booked the second time he was penalised for it. With a one goal lead, there was always going to be an element of nerves in the final moments, but in truth, Crusaders never looked like scoring, as Linfield held on for the 1-0 win. That result puts them six points clear of Crusaders with a game in hand, and maintains a three point lead over Ballymena, who won 2-1 at Glenavon. Ballymena dropping points would have been great, but it does mean that we can officially rule Glenavon out of the title race, although the ten point gap at kick-off made it generous to consider them still in it. Up next, is a trip to Newry on Tuesday night. Curiously, due to Institute’s involvement in the North-West Cup Final, Ballymena’s game against Institute has been postponed. Three points is a must. We can go nine clear of Crusaders and six clear of Ballymena, laying down the challenge to them to catch us if they can. Curiously, Crusaders and Ards are the only teams in the League who don’t have outstanding games to play. After that, is Glentoran at home on Sky the following Monday night. That was worked out quite well for us, spreading the games around having come through a busy December period and only having one free midweek in that time. Personally, it also blocks off 29th January as a date for the County Antrim Shield Final, which is good for me as i’ll be in England. That game, will be against Crusaders, who we’ll face in the Irish Cup three days before. Nothing to fear, as we’ve proved three times this season. There are too many teams in the Irish League who are afraid of Crusaders. Those games are ticketed, most games are at the moment. Thankfully, we’ve had quite a few Saturday home games for supporters to get tickets. Also, a Ticketmaster outlet has opened up in the Tourist Information Centre in Belfast City Centre if that’s more convenient for you. There is also the possibility of a Two Ronnies-esque situation at the Ticket Office. Since I last wrote, there’s been a few ins and outs. Mostly outs, which isn’t surprising given the size of our squad. Eammon Scannell, Ryan Strain and Jonathan Smith have all left on loan. Not that surprising in the case of Smith. I wouldn’t be surprised if Brandon Doyle joined him going out on loan. Kyle McClean came in from St Johnstone, and was an unused sub for this game. I don’t know much about him. That incoming meant that Robert Garrett was allowed to leave, heading to Glenavon. It wasn’t really a surprise to see him leave, but I thought that wouldn’t happen until the Summer. I’m slightly surprised we didn’t “Play the system” and loan him rather than letting him leave, as this would block him from playing against us this season. It’s absolutely certain if Glenavon were a lot closer to us in the table, there’s not a hope in hell we’d be so accommodating. Garrett will be facing us on Friday 8th March live on BBC 2, as the latest TV games have been announced. Two Glenavon matches on BBC to go with another one of their games on Sky next month. They might as well have their own channel. The draw for the FA Cup 4th Round has confirmed that United’s match against Burnley will be on the Tuesday night. As I now have the Wednesday free, i’m tempted to do a day trip to Sheffield, having last been there in 2010. I was in London on the weekend of the 4th Round last year and went to Millwall v Rochdale. I picked the wrong year. If I went this year, I could do Arsenal v Man United, day trip to Brighton for Brighton v West Brom and then Palace v Spurs. I’m actually thinking of doing a London/Brighton double header in July 2020, over the 12th Holidays, catch a pre-season game and soak up the atmosphere of the European Championship Final. Pre-Season 2020 can wait, the 2018-2019 season is far from resolved. December began with a top of the table clash on the first day, but not the result I wanted as Linfield lost to Ballymena United. The following Saturday was a lot better, as Linfield thrashed Crusaders 4-1. No football the following Saturday, meant a gap in photo adventures, before seeing Ash at The Limelight, followed by Linfield’s match against Glenavon. Of course, there are still two more football matches for me this month, Linfield’s games against Glentoran (26th) and Cliftonville (29th). Hope you’ve enjopyed my photographic look back at 2018, here’s to more in 2019. Already booked for 2019 – Chvrches, Razorlight and a short break in Dublin. August 2018 was a busy month, and it began at Mourneview Park for the start of the 2018-2019 season as Linfield beat Glenavon 1-0. The following weekend, I headed to Custom House Square to see George Ezra in concert. That was followed by a day trip to Bangor where I squeezed in some Street Art photos, including a mural of John Lydon. It was then back to the football as I went to see Edinburgh City take on Albion Rovers in the Scottish Challenge Cup while on a short break in Edinburgh. I also managed to get some Street Art photos while in Edinburgh. 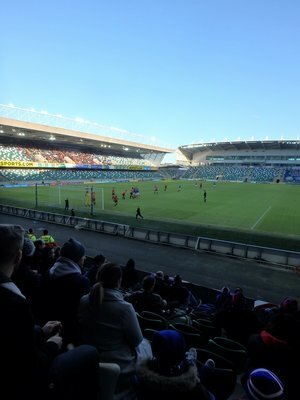 Upon my return to Belfast, was a trip to Seaview to see Linfield take on Crusaders. The next few days were spent at Custom House Square, seeing Kasabian, Turin Brakes and Travis in concert. The following Saturday was a trip to Solitude to see Linfield take on Cliftonville. This winner of this match was never going to automatically go on a title charge, and the loser was never going to be out of the title race. However, it is Crusaders who are trying to take that positive spin, as Linfield put in a display that was more exciting than a branch of Primark opening. At one point this season, Linfield’s points lead over Crusaders was in double figures, but dropped points over the past eight weeks had seen that reduced to five, giving Crusaders a sniff at the title when Linfield should have been out of sight. A win here, and they would be two points behind Linfield and right into the mix. Linfield were straight on the attack, winning a corner inside the first minute that Josh Robinson was unable to get on the end of an repeat his feat of scoring in the first minute of this fixture, as he did last season. Meanwhile, Chris Casement had a free-kick go over while Kirk Millar and Jordan Stewart were unable to get on the end of a Jamie Mulgrew cross. Eventually, Linfield took the lead when Stephen Fallon played in Joel Cooper in acres of space. Crusaders defenders backed off him, which only invited him to shoot, doing so, and putting Linfield 1-0 up via a deflection. Just like on Crusaders last visit to Windsor Park, Linfield got an early goal and were on top. That day, they couldn’t get a second goal and let Crusaders away with it. Not today, they were thirsty for more. A few minutes later, another attack saw Jordan Stewart run at Crusaders defence. He had options left and right but decided to shoot, his effort deflecting out for a corner. That resulting corner saw Jimmy Callacher head home to put Linfield 2-0 up, just as he did against Crusaders at Windsor Park on New Year’s Day 2016. The uncertainty in Crusaders defence not being helped by announcing the signing of a new goalkeeper on Thursday night, with the current occupant knowing he has a month of games to play before being replace in January. It clearly had an effect. Not that Linfield were worried by that. When Crusaders hit crossfield balls, they went out for a throw. When Linfield hit crossfield balls, they would find somebody, usually Joel Cooper. Kyle Owens, playing despite being sent-off last week (I assume his red card was successful in appeal, or it has been appealed in order to stall the ban) being dragged out wide, and looking as comfortable as you’d expect a big lump playing at full-back to look. Paul Heatley had a speculative shot go wide. That was as close as Crusaders got in the first-half, barring a shot which looked to be going over, but dropped down and hot the top of the net. Andrew Waterworth chased a through ball, getting to the ball ahead of a defender, but his quick shot hit the keeper and went out for a corner. Linfield knew if they got a third, it would secure the points by half-time, but they just couldn’t get it. Just as importantly, they kept Crusaders out, the main significant difference between this game and the game against Cliftonville a few weeks back. Even if it was 2-1, Linfield still would have left the pitch confident of getting the points. Crusaders were all over the place defensively. A couple of throw-ins from Sean Ward saw Crusaders losing the ball in areas where you don’t want to lose the ball. Every time there was a break in play, Crusaders defenders were having an impromptu conference. At half-time, Billy Joe Burns and Philip Lowry came off the bench as Crusaders looked to get a goal back. All they offered in the early minutes was a shot from Paul Heatley which was easily saved by Roy Carroll. Soon after, Linfield got the third when Crusaders couldn’t clear a free-kick, and it fell for Josh Robinson to smash home. A few minutes later, Joel Cooper nutmegged Sean Ward and played in Jordan Stewart. If it was me, I would have smashed it in, but decided to go around one defender and the keeper before firing into the empty net. It was like a cover version of his goal against La Fiorita last season. What stands out the more you watch the video of the goal, is that Billy Joe Burns gives up and doesn’t chase back as soon as the ball goes to Stewart. If he did, he might have been able to stop him from scoring, or put him under pressure. His season, like his Linfield career, has taken a while to get going. Now to keep this up. Crusaders pulled a goal back when Philip Lowry scored from close range after a corner. You never got the feeling that it was going to be the start of a comeback, and so it proved, as Linfield held out for the 4-1 win. It would have been nice to get a first clean sheet in nine games though. They almost won 5-1 when a counter attack saw substitute Michael O’Connor unable to get on the end of a cross. Appropriately, the match ended with Linfield keeping the ball for the final minute of injury time and Crusaders unable to get it. It was like that the entire game. Not only does this win put Linfield eight points clear of Crusaders, they went six points clear of Glenavon (albeit with a game more played). They still remain behind Ballymena United. With home games for Ballymena against Institute and Newry City between now and Boxing Day, you’d expect their winning run to continue. And it gave their goal difference a boost. You can’t really rule out a team until Linfield go ten points clear of them. Linfield only have that gap from Coleraine, but Coleraine have a game in hand. The truth is, Linfield are looking up and have a cushion from the teams below them. Next Saturday, sees a trip to Newry, which has been pushed back to Saturday from Friday night due to Linfield’s involvement in the NIFL Cup. You have to say fair play to Newry regarding that, as they would have been entitled (and probably tempted) to tell Linfield to clear off when asked to move the game. The 1pm start gives Linfield a chance to put points on the board early in the day and put the pressure on their rivals as they enter the pitch for their 3pm kick-offs. Before that, is a trip to Stangmore Park in the NIFL Cup with a place in the final up or grabs. Feeling pessimistic about this, Dungannon are due one against us. I’m not saying we are awful in this competition, but it was so long ago since we won it, Glenn Ferguson scored the winner. Talking of negative optimism, Glentoran haven’t won in eight matches (seven in the League). The thought of them going into Boxing Day without a win in nine fills me with dread. You know what will happen. Since my last blog, the fixtures for Euro 2020 Qualifiers have been announced. Estonia and Belarus at home first. That’ll do. Then the return games in June 2019. We simply need to have twelve points on board before we face Holland and Germany. The first games against those two, in September and October, are standalone fixtures. Unfortunately, UEFA rules state that teams must play a friendly on free dates, which is inconvenient, as Northern Ireland would be better off concentrating on that one Qualifier and not have a friendly in the way. I imagine there will be a friendly arranged before the June double header in order to stop players going stale after so long without a game for their clubs. A random game in a random English ground, like Qatar in Crewe would be great. The away game in Holland will be in Rotterdam. I’ve been to Rotterdam, and listened to Rotterdam by The Beautiful South on my ipod as I entered. I went to a match there, between Excelsior Rotterdam and VVV Venlo, which even had a player eligible for Northern Ireland playing. I visited De Kuip to have a look around, though there was no match on. The home match against Holland will be on Saturday 16th November at 7.45pm, so it will mean Linfield will be away that weekend, though the date is still to be confirmed. Previously, when Northern Ireland have been at home on a Saturday night, there have been 3pm games that day. Hopefully, Linfield won’t have a long trip that day if they do play. Another draw this week was the Irish Cup. You always want a lower league team away. We got one at home. I would have been all over Ballyclare away, even though my last visit there was a defeat in 2014. And finally, the game against Glentoran on the 26th is live on Sky. That’s 26th January, and it’s now been moved to Monday 28th January. I fly out to Manchester the next day. Good job it’s not an early morning flight. That will be Linfield’s second appearance on Sky Sports this season. Let’s hope for a third one in mid February. April 2018 began for me with a trip to Smithfield, to snap a new mural commemorating Smithfield Market. Two days later, on Easter Tuesday, it was a trip to Lurgan for me to see Linfield take on Glenavon. It was a month dominated by football, as I went to Linfield’s matches against Ballymena, Crusaders, Coleraine and Cliftonville. The month ended as it started, with me checking out some Street Art, well, mostly the now finished garden at CS Lewis Square which featured a tribute to famous East Belfast people and landmarks. Do not be afraid of Crusaders. Do not be afraid of Crusaders. Do not be afraid of Crusaders. There are too many teams in this League who are afraid of Crusaders. Shamefully, last season, Linfield were one of them. The opening two games of 2018-2019 suggested that Crusaders were there for the taking. In the opening game, they blew a 2-0 lead against Ards and needed a late goal to secure a 4-2 win. That was followed by a 2-2 draw at home to Ballymena United. A team full of players approaching or in their 30s who are leaking goals. There was nothing for Linfield to fear. Especially so, as they had won their opening two games without conceding a goal. Despite that, this was not going to be an unchanged Linfield team, now that Jamie Mulgrew was back from suspension. There’s a case to be made for resting Jamie Mulgrew against last season’s bottom five (Dungannon, Ards, Warrenpoint, Institute and Newry City) considering his age and the fact he is returning from injury, picking and choosing his matches. Even if he is picking and choosing his matches, this is a match where he would play if it. It was expected that Niall Quinn or Andrew Mitchell would miss out, but it was Kirk Millar who did, with Quinn moving out left. Just like at Lurgan two weeks previously, there was a sizeable away support there to cheer their team on. It was Crusaders who had the first chance of the game when Ross Clarke drifted past four players before shooting straight at Roy Carroll. He really should have scored, considering he had a clear strike at goal and a choice of sides to go to. Having survived that, Linfield came more into the game, spending a lot of time in Crusaders half and winning a succession of corners. Nothing came of them but Crusaders weren’t fully dealing with them. Not once did Sean O’Neill catch one, his punches not fully clearing the danger, giving Linfield a second ball to fight for and keep the attack alive. It was a first-half littered with Crusaders yellow cards. Oh the joy of seeing a ref prepared to not tolerate their tactical fouling, and a Linfield team prepared to stand up to them. Crusaders didn’t know how to respond. They lost their discipline, and handing the game to Linfield. Linfield players knew this, which is why they were so keen at times to stop Josh Robinson getting involved. They had Crusaders right where they wanted them, and they weren’t going to give up this advantage easily. Chris Morgan on Radio Ulster seemed to be offended by Linfield players surrounding the referee. He may have a point that it’s not nice to see, but teams freely do it against Linfield. Too many times last season, Linfield were outsmarted by stupid teams. Crusaders players were being told in no uncertain terms that they wouldn’t be kicking anybody off the field today. Joel Cooper was Linfield’s main attacking threat in the first-half, having Linfield’s two main shots at goal. The only moment of worry that Linfield had was when Jimmy Callacher had to head out a cross in the six yard box out for a corner. On 35 minutes, it was Linfield who get the breakthrough when some neat passing out the right, where Linfield were getting a lot of joy through the half, saw Chris Casement cross low for Joel Cooper to finish from close range, a reversal of the previous week against Institute when Cooper crossed low for Casement to score. Cooper was everywhere when Linfield attacked, and Crusaders didn’t know how to handle him. They didn’t know which way he was going to go. Thankfully, Linfield’s players did, and wether he went left or right, there was always someone available for a pass. Linfield began the second-half, now attacking their own fans, on the attack, with Chris Casement having a free-kick saved. Again, it was another punch by Sean O’Neill. The second goal wasn’t long in coming when Joel Cooper got possession on the right wing, cut inside before playing a defence splitting pass. I was on the opposite side and thought initially that it was Niall Quinn, but it was actually Jamie Mulgrew, who made no mistake to make it 2-0. It wasn’t quite the three points in the bag, but it was hard to see Crusaders coming back from this. Crusaders response was a Jordan Owens shot which went over and into the stand. A Crusaders supporter threw the ball away from Roy Caroll who was waiting to take a goal kick. The supporter celebrated as Carroll was able to take his time, and kill any hopes Crusaders had of getting some momentum and getting back into the game. They really aren’t the brightest. In fact, the closest that Crusaders came was from a sliced clearance by Matthew Clarke hitting the bar. At no point did Linfield look troubled. If any team looked likely to get the next goal, it was Linfield, with Michael O’Connor, on as a substitute for Andrew Waterworth, getting in behind Crusaders defence only to see his low shot saved, while a deflected cross from Daniel Kearns almost snuck in. Joel Cooper was replaced by Kirk Millar, a bit surprising, as Andrew Mitchell was getting bandaged up for the umpteenth time. A few minutes later, Mitchell couldn’t carry on any longer, being replaced by Robert Garrett, who was able to help Linfield see the game out with no fuss. This result sent Linfield five points clear of Crusaders. Nothing to get too excited about, they were five points clear of Crusaders at this stage in 2015. The game after this would be a trip to Cliftonville. A win would give Linfield an eight point lead over them. The matchday after that sees Crusaders face Coleraine. With one of them dropping points, the game against Ards is a must-win. That is followed by a game against Warrenpoint while Crusaders and Coleraine are playing in the Scottish Challenge Cup. There is a great opportunity to get some momentum and pull clear of rivals. Linfield players celebrated this win in dignified fashion, there was no throwing of food in Nandos. Later that night, David Healy made a guest appearance in the Panto taking place at Windsor Park that night, content that his side landed a massive punch, but not quite a knock-out blow. April’s football watching began with a trip to Mourneview Park on Easter Tuesday to see Linfield grind out a 3-2 win away to Glenavon. That was followed on the Saturday afterwards by going to see Linfield beat Ballymena United 2-0. Good start to the month, but that was as good as it got, as Linfield could only managed one point from their next three games against Crusaders, Coleraine and Cliftonville, which would cause them to eventually miss out on European football. There was only one match for me in May, a trip to Old Trafford to see Manchester United take on Watford. And that, was the 2017-2018 over for me. Here’s to more football and photos in 2018-2019.